This blog post was made by Beth Witten, MSW, ACSW, LSCSW on February 7th, 2019. Being sensitive and understanding emotional reactions to the diagnosis of a chronic illness that is terminal without treatment. Spending the time needed to learn the patient’s wishes about advance care planning. Determining how realistic the patient and family are about the progression of kidney disease and prognosis, given age and other health status. Learning what control the patient wants/needs vs. the control s/he wants to delegate to family and/or the physician related to decision-making. Eliciting what the patient’s minimum level of independence is. Asking what support is available now and in the future from loved ones and how the healthcare team or others can supplement that support. Informing the patient and family about what symptoms to expect, how they can be controlled, and how long survival might be with conservative management vs. dialysis or transplant, if a candidate. Education and communication about these and other topics will likely need to occur over several visits. A recent study showed that healthcare providers have limited understanding of what patients want from a conservative kidney management (CKM) program. Interestingly, the only thing that appeared on both patient and clinician lists was a peaceful death. However, although patients rated a peaceful death #1, healthcare providers rated it #9.1 In another study, patients reported their top priorities as maintaining independence (49%), staying alive (35%), and reducing pain (9%) and other symptoms (6%). Only 35% of the time did providers and patients agree on priorities.2 Finally, a survey3 of dialysis staff and administrators showed that the top 3 unmet needs were bereavement support, spiritual support, and end-of-life care discussions. They didn’t know that clinical practice guidelines for decision-making4 and an evidence-based prognostic model5 are available. These studies indicate that more education and communication are needed. Most American patients are under the care of a nephrologist prior to starting treatment for kidney failure. While fewer than 25% had no nephrology care and almost 60% had seen a nephrologist for 6 months or longer,6 my recent blog reported that very few chronic kidney disease (CKD) patients with Medicare have claims for kidney disease education. For Medicare payment in the U.S., education must include not information about dialysis and transplant, and also the choice of not to do dialysis or have a transplant.7 Neither the regulation nor clinical practice guidelines require patients to demonstrate knowledge or confirm in writing that they have been informed of all options, including conservative management. A patient may choose not to start dialysis or have a transplant or may choose to withdraw later from treatment—often because the burdens of their illness exceed the benefit they feel they’re getting from it. Hospice care is underutilized for ESRD patients in the U.S. Among more than 770,000 HD patients who died between 2000 and 2014, just 20% were on hospice when they died, and, of these, 41.5% died within 3 days and 65% died within 7 days of hospice admission.8 The authors expressed concern that ESRD patients’ shorter hospice care may result in unmet emotional needs and inadequate pain management. Those who lived longer were more likely to have cancer or dementia as their primary diagnosis and less likely to have kidney failure as a primary diagnosis or to have discontinued dialysis.8 In other words, those who didn’t have a primary diagnosis of kidney failure were able to continue dialysis AND get hospice for their non-ESRD or ESRD-related diagnosis. A doctor certifies the patient is terminally ill with 6 months or less to live. The patient is willing to accept comfort care rather than curative care. 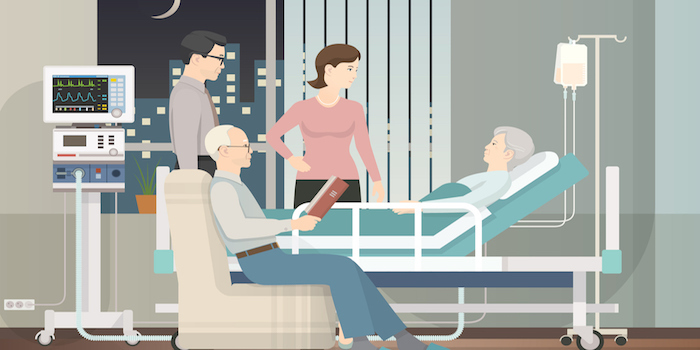 The patient chooses a Medicare-approved hospice that accepts Medicare payments and signs a statement accepting care just through Medicare’s hospice benefit for terminal and related conditions. Short term Respite care. If a usual caregiver (like a family member) needs a rest, inpatient respite care is covered in a Medicare-approved facility (like a hospice inpatient facility, hospital, or nursing home). A hospice provider will arrange this. A patient can stay up to 5 days each time respite care is needed, and it is possible to get respite care more than once—but it can be provided only on an occasional basis. Some hospice agencies may provide other services in addition to those that Medicare covers. It’s important for patients and/or their families to know who pays for hospice. Medicare Part A covers everything a patient needs for the terminal illness and related conditions. All the patient would need to pay is $5 per product for pain or symptom management and 5% for inpatient respite care if needed. Medicare’s hospice benefit won’t cover curative treatment, services from a provider who is not included in the hospice plan, or room and board in a nursing home or home.10 The hospice benefit won’t cover dialysis for patients whose terminal illness is ESRD-related or exacerbated by ESRD. However, Medicare will cover dialysis if a terminal illness is unrelated to ESRD.11,12 If a patient does not have Medicare, hospice services may be covered by other insurance or Medicaid. Some hospice agencies may serve uninsured people. The only way to know is to ask. Medicare’s Hospice Compare website allows patients and/or their loved ones to look up area hospices by name or location. The database provides the option to compare a hospice’s results on a caregiver survey and on quality of care with national data. The list can be filtered by ownership type. The goal of palliative care is to improve a patient’s quality of life by treating symptoms and side effects and helping to meet emotional, physical, spiritual, social, and practical needs of patients and their families. Be aware that families are likely to need even more emotional support than patients who may be at peace with their end of life decision. People with kidney failure are among those whom palliative care can help. Palliative care may be offered by hospitals, home care agencies, cancer centers, and long-term care facilities.”13 Payment for palliative care may be covered by Medicare Part B, Medicaid, and/or other insurance. Ask the palliative care agency who pays. Referrers can use the Palliative Care Provider Directory to find a palliative care provider for their patient by zip code, city or state and where palliative care is provided—hospital, nursing home, clinic, or home. In addition to helping locate a palliative care program, the website has a blog and basic information about what palliative care is and whether it’s right for your patient. Challenges to Conservative Management for ESRD in the U.S.
Nephrologists who feel uncomfortable talking with patients about advance care planning, conservative management, and prognosis don’t have these discussions. Greater exposure to these topics during fellowship training could lead to more discussions. Patients’ fear of aging and death leads to denial and lack of advance care planning and poor acceptance of the need to plan. Patients may believe doctors can cure all conditions. Physicians may see their inability to cure a patient as a personal failure. Patients and families may see foregoing or stopping treatment for ESRD as suicide—although most organized religions do not. Physicians and others seldom refer ESRD patients for hospice or palliative care. Hospice agencies fear Medicare won’t pay separately for costly dialysis and refuse to admit those with ESRD—even when ESRD is unrelated to a terminal condition. Hospice agencies view a patient’s continuing dialysis or immunosuppressant medications for a transplant as contrary to hospice philosophy. Physicians and other staff may not understand how payment for hospice and palliative care work. Dialysis and transplant programs are profitable with a financial incentive to treat all who want it, including those for whom there is little chance to extend life with quality. In my country, the Victorian Department of Health requires patients to be educated about all options for treatment of kidney failure, including conservative management, and data on education is collected as a Key Performance Indicator (KPI). The renal team and/or CKD coordinator refers patients for palliative/hospice care. Our healthcare system is also called Medicare, but while your system is a confusing labyrinth of different alphabet letters that may or may not cover hospice or palliative care, our Medicare is a system of universal healthcare. Under our Medicare, patients have a universal right to healthcare, including a blended service of hospice and palliative care provided with no cost to the patient. To us, that patients in the U.S., including those who are dying, have to worry about who pays for needed care seems unnecessarily cruel. When the chips are down, a civilized society should attempt—as best as is possible—to provide two key non-negotiables to its citizens: education and healthcare. Education and healthcare should be ensured and delivered by the state as basic human rights, independent of any capacity to pay. When it comes to the delivery of complex healthcare—such as that which accompanies approaching end stage renal disease—education and healthcare blend, and the two become indivisible and interdependent. The successful education of patients and families about the multiple available renal replacement options, while time consuming and difficult, depends on (1) a multi-disciplinary care team that is (2) equally available to all at no cost. These principles of equity and access are never more necessary in global healthcare delivery than for those facing end stage kidney disease. Education around end stage kidney disease should always include both interventional and non-interventional options, recognizing that not all patients—and particularly, but not exclusively, the elderly—seek or wish to embrace complex care at the end-of-life. A conservative care pathway should not be presented as a “failure,” or as a “lesser” option, but as a valid choice in which, if made, the patient and the family will be valued and supported by the care team. All Australian renal services have, or have access to, hospice teams and full in-home or in-hospital palliative care. Both these services fall under one over-arching palliative care function, and are not arbitrarily split into two care pathways. While many Australian renal services actively manage and support their own conservative care programs, others use generic community-based programs that provide community-based support to other non-interventional care choices in oncology, cardiology etc. These end-of-life support programs are provided to all Australian citizens at (1) no additional cost under (2) the umbrella of the national universal Medicare healthcare program that provides healthcare for all. In Australia, some 45% of citizens currently do choose to pay extra for additional but optional health insurance – insurance that is primarily used to circumvent public (non-insured) waiting times for elective surgery. However, health coverage has no bearing on the access to or availability of acute and/or chronic medical illness, or to end-of-life palliation for all citizens. If an Australian elects at any time to choose conservative medical management in place of interventional renal replacement care, this is (1) always fully covered and (2) is provided at an equal and professional level of care, as or when needed – whether in the home or in a care facility. Insurance, cost, and the ability to pay are not factors in the decision process. I provided a view of care, including conservative management in the U.S. healthcare system while Dr. Agar wrote about care, including conservative management under the Australian universal healthcare system. Australia has been recognized as a model for palliative care.18 Looking at these two systems of kidney healthcare makes me wonder, how does each show what it values most – the well-being of providers or the well-being of vulnerable people with kidney disease? You decide. I hope the kidney community takes the necessary steps to remove barriers to patients being informed about and having the option to choose conservative management of kidney failure in their preferred setting with the support of their nephrologist, hospice, and/or palliative care. Very thoughtful and well-done article. Thank you including the Australian perspective and info.